A new way to serve cauliflower and cheese! If you’re trying to get your kids to eat more cauliflower, these crispy little balls covered in panko breadcrumbs are a great way to serve it to them. 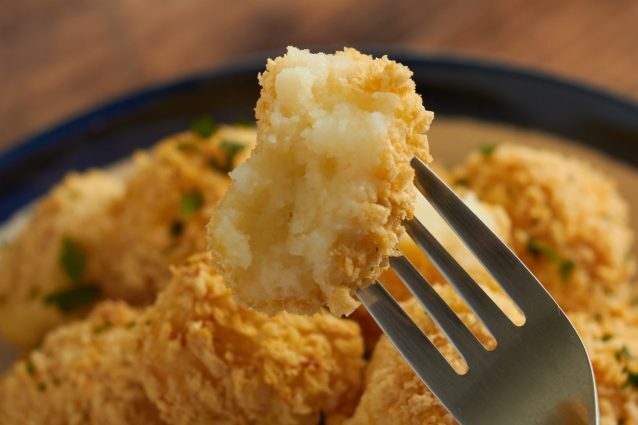 The parmesan cheese adds a lovely taste, and the crisp breadcrumb coating covers the soft and tasty cauliflower and cheese combination which goes so well together. Serve these as an appetizer or side dish. Steam cauliflower until very soft. Add cauliflower to a colander and shake a few times to drain out excess water. Place a few paper towels on top of the cauliflower and apply pressure to squeeze out water. Also use paper towels to pat dry the cauliflower. The more water you squeeze out, the less watery your mashed cauliflower will be. This will make it easier to work with when you form the balls. Add cauliflower to a food processor. Pulse on high speed until smooth. Add in parmesan cheese and cream cheese. Pulse until smooth. Taste and add salt if needed. Using a 1.5 tbsp cookie ball or coffee scoop, get packed balls of mashed cauliflower and place onto a baking sheet lined with parchment paper. Shape balls slightly so that they are mostly smooth and round. You should be able to make approximately 24 balls. Freeze balls for several hours until solid. When ready to make the crispy mashed cauliflower balls, preheat oven to 375°F/ fan 170 C/ gas mark 5. Line a large (three-quarter) baking sheet with parchment paper. Spread out panko bread crumbs onto baking sheet in a very thin and even layer. If your baking sheet is too small, you can use two baking sheets. Spray panko lightly and evenly with canola oil spray. Bake about 5 minutes until crumbs are a light golden brown. Allow crumbs to cool. Increase oven temperature to 400°F/ fan 180/ gas mark 6. Line a separate baking sheet with parchment paper. Remove half of the mashed cauliflower balls from the freezer. Working quickly, coat mashed cauliflower ball in egg, making sure to shake off any excess egg drippings before adding it to the panko bread crumbs. Place ball onto sheet of panko crumbs. Scoop some panko on top until it covers ball and press crumbs onto ball. Remove ball and place prepared baking sheet. Repeat with remaining balls. When finished with first set of balls, remove second half from freezer and coat the same way. Place the coated balls into the oven. Bake for about 25-30 minutes or until balls are crispy, golden and warmed all the way through. Garnish with chopped parsley if you want, and serve warm. Because these are baked, they will not stay crispy for as long as the fried version. If you want to make them ahead for a party, consider pan-frying them instead of baking, as they will stay crispy for longer. Keep the egg mixture away from the panko breadcrumbs – if egg drips into the crumb tray, they won’t stick to the balls.